One of the K Team has her birthday this week, so I bought her a little present that she was admiring when we went to Pigeonhole. 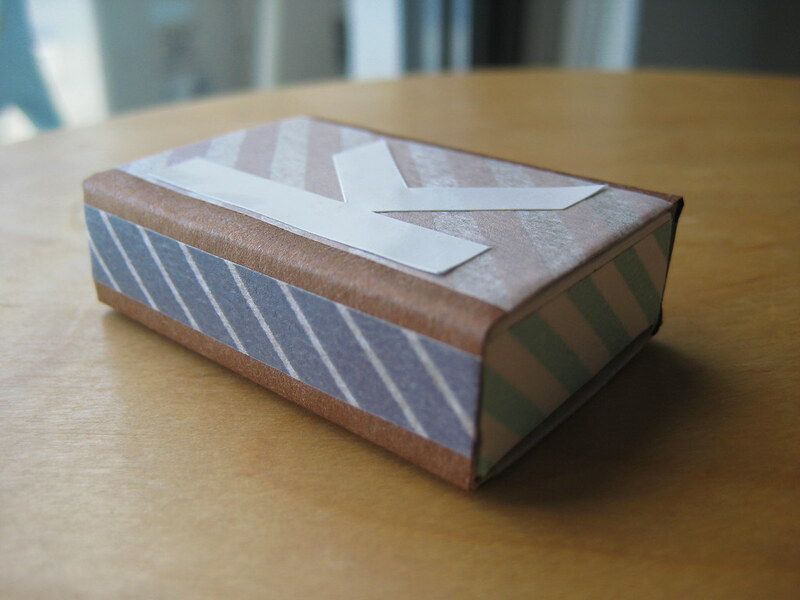 I covered a matchbox in brown paper yesterday and was pondering how to decorate it. I took a study break in Northbridge for lunch/coffee/guilty shopping and found the perfect solution - Lala Orange had mt Japanese masking tape on sale! 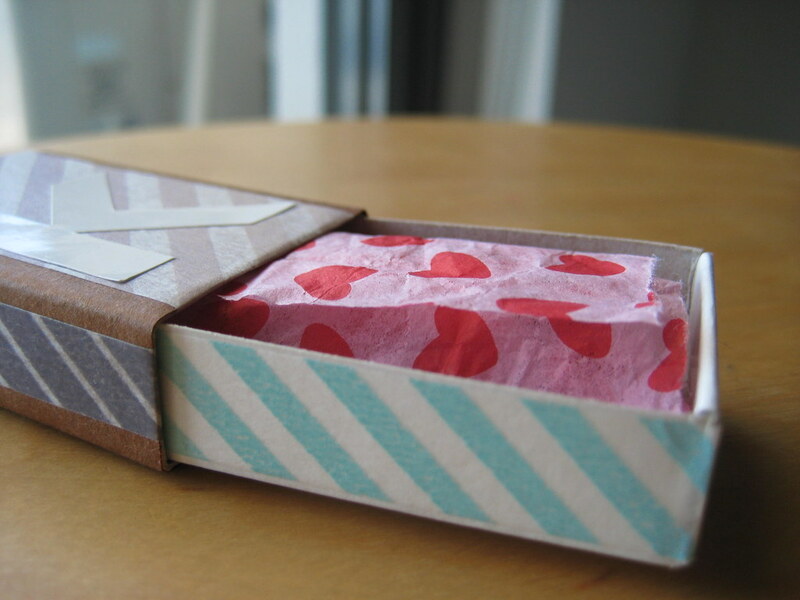 I bought a five pack (okay, and a couple of pairs) and used some of the different widths to decorate my little matchbox. I topped it off with a "k" sticker from kikki.K and of course I finished it off with my label machine. Open it up...and there's some tissue paper I recycled from my Knick Knack Exchange gift. 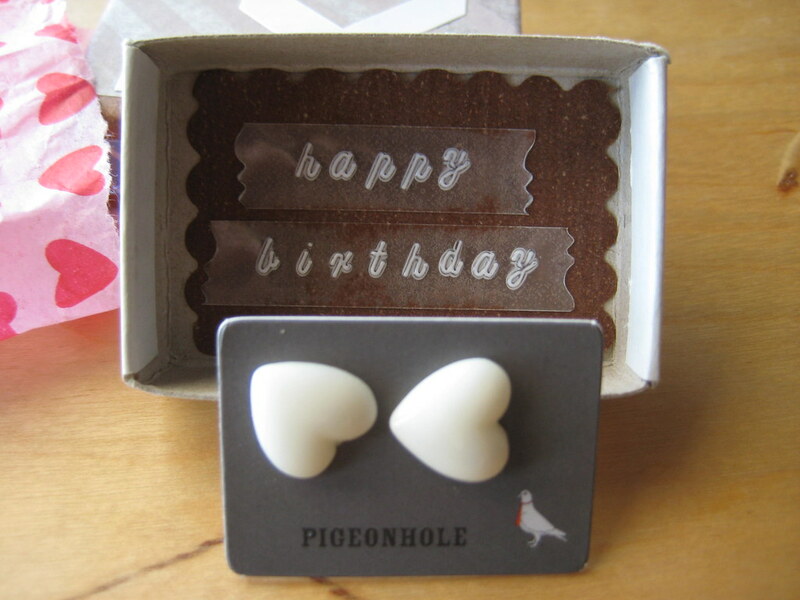 Little heart earrings! I hope she likes it. I discovered you blog through Bianca's Good Night Little Spoon blog and I've been reading it for the last hour and I think it's awesome!! Great blog!! I'm loving it! And loving the matchbox present. I love all the ways I see matchbooks decorated in blog land lately!! What a fun way to wrap a gift!! Those earrings are cute too! awwww nice nice! i love the little hearts wrapping paper. opening pretty packages like that makes my heart flutter!! Why is it taking so long? Is it coming by land?